Shots of a currently-in-progress custom order for a customer in Seattle. There's a lot of new stuff going on in these photos. This is a brand new style, a short top hat (traditionally known as a 'John Bull') I'm calling the 'Johnnie'. The style is part of my new Midi range- just smaller than a full size hat, but not as small as a mini, these hats look more like a full size hat on the head but are just perchy enough that sizing is not an issue (one size fits all). The hat in these photos was made with a piece of the ultra-rare, 50+ year old long-nap felt I've collected. It feels and looks like silk plush, and has a softness and quality that are above and beyond any felt being produced today. Some of them, like this one, have a luminous sheen that's just made for top hats, it's really breathtaking. I have a stash of these in different colors available for custom orders, and almost all of them are one-of-a-kind pieces. Contact me if you're interested in finding out more about this amazing material. I've started using this unusual type of ostrich feathers. Unlike most of the ostrich feathers you'll see elsewhere, these are long, slinky, and have wonderful drape and motion. 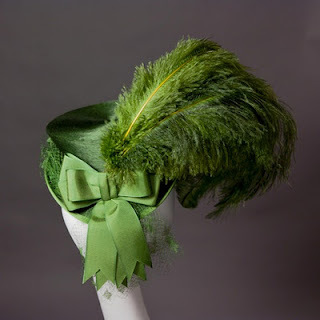 These feathers were custom dyed to match the hat felt, with a mix of dyes that resulted in a beautiful variegated tone. I also dyed some peacock feathers using the same dye, but I haven't finished the trim to be made with those yet. I love doing custom work, especially when it gives me the opportunity to try new things and learn new skills, and collaborating with my customers makes it extra interesting. 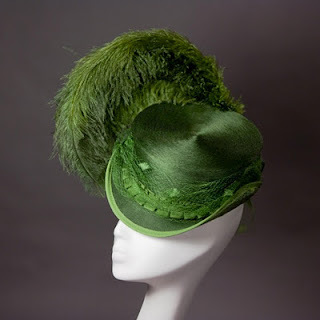 Have any ideas for your own custom hat, or one for a friend? Just let me know.